You may have checked your smile out in the mirror recently and noticed that your teeth aren’t as white as they used to be. Even though you brush and floss daily (of course!) and keep your sugar consumption in check, your teeth may be starting to develop a yellowish tint. But, that doesn’t necessarily mean that your teeth are in bad shape. Nobody has naturally sparkling white teeth, and your discoloured teeth could be a result of many factors, from your age to your genetics. Plaque or tartar: the most obvious one, and is most definitely caused by bad brushing habits. Plaque forms when bacteria particles aren’t cleaned properly, or on a regular enough basis, from your teeth. The yellow coating can simply be a build up of plaque, which also contributes to bad breath. Plaque hardens over time, and eventually requires dental intervention to remove. Diet: some of your favourite food and drinks could be the culprits of your yellowing teeth. Black coffee, pasta sauce, curries, berries, balsamic vinegar, red wine and soy sauce are staining your teeth. If you aren’t read to eliminate these from your diet, always make sure you’re brushing thoroughly before and after consuming them. Ageing: we hate to tell you this, but getting older makes your teeth more susceptible to stains. Your tooth enamel wears down over time, wearing down the protective surface layer and revealing more of the yellow dentin underneath. Medication: Antibiotics including amoxicillin and tetracycline can effect the colour of your teeth, as well as medication for allergies and high blood pressure. If you’re concerned that this may be a side effect of your medication, speak to your doctor right away. 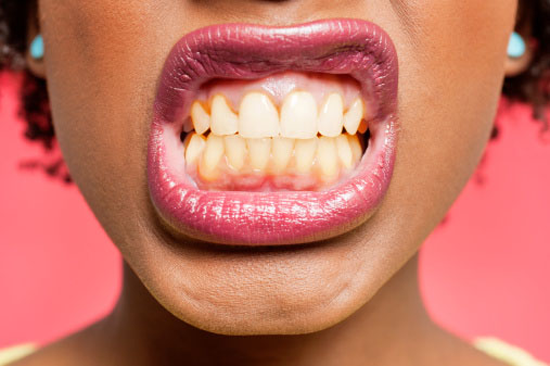 Genetics: unfortunately, your parents may be to blame for your perpetually yellow teeth. Genetics don’t only effect the colour of your eyes and hair, they also have an impact on the porosity of your tooth enamel. Enamel that’s more porous is more vulnerable to discolouration and stain. Quick fact! Your lipstick could be making your teeth appear more yellow than they really are. 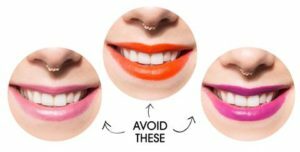 Bright lipsticks with coral, orange and frosty pink undertones are the worst offenders. 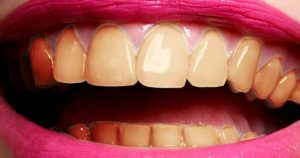 If you’re self conscious about your yellow teeth, there are several things you can do right now to get your smile back to white and bright. Book your bi-annual cleaning with your dental hygienist: your cleanings are crucial to keeping your teeth at their optimal appearance. You’ll be surprised to see how much whiter your teeth appear after a single scaling and polishing. You may also consider asking your dentist for a custom fitted take-home whitening kit, a complimentary gift to all of our new patients! Natural whitening solutions: if you’re going the DIY route, we wouldn’t immediately recommend purchasing whitening strips from the drug store, which can be harmful to your teeth over time. Instead, try natural solutions such as apple cider vinegar, baking soda or activated charcoal. 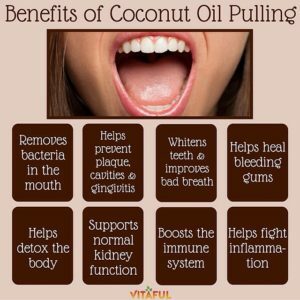 Coconut oil pulling is also known to have immense oral health benefits. Simply swish a tablespoon of coconut oil in your mouth for 10 to 20 minutes a day several times a week, then brush your teeth as normal.